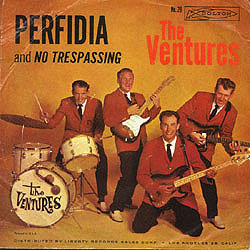 The Ventures took this hoary standard (five versions hit the Top 15 in 1941) by the scruff of the neck. Treating it in the broad manner of their spectacular ‘Walk, Don’t Run’, they raced through it in top gear, refrained once more from taking excess baggage on board – musical or otherwise – and turned it into one of the most exhilarating couple of minutes in the history of guitar instrumentals. Hitting UK No.4, it out-performed at around this time both ‘Man Of Mystery’ and ‘FBI’. Like its brilliant predecessor, with which it can be combined almost seamlessly, it has become a recurrent element in medleys performed on stage. The latest studio re-recording, on the 1999 CD (Japan) V-Gold, though not as light on its feet as Mark I (that superb metallic twang and the spontaneous feel give way to a fuller, more rounded sound and a more considered styling), is still a fine testimony to the number’s staying-power. 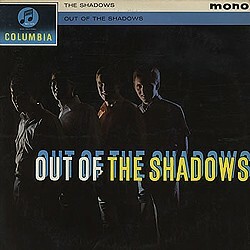 The Shadows’ version can lay no claim whatsoever to longevity: for their Strictly Come Dancing account of things, stylistically in keeping with a number of the ‘standards’ recorded with Cliff Richard in the 1961–1963 period (compare the version they recorded together for the LP When In Spain of October 1963), see Introduction.